Recap - World Series Game 5: Sox one win away! 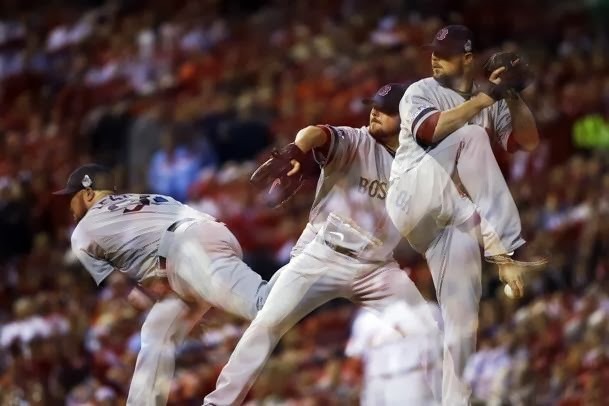 David Ross and Jacoby Ellsbury each drove in runs in the top of the seventh inning and Jon Lester was dominant through 7.2 innings as the Red Sox nipped the Cardinals 3-1 in Game 5 to take a 3-2 lead in the 2013 World Series. Lester allowed just one run on four hits. He struck out seven and didn't walk a batter. Koji Uehara came on to earn a four-out save. With the score tied 1-1 in the top of the seventh, Xander Bogaerts snuck a one-out single up the middle. Adam Wainwright inexplicably walked Stephen Drew, and Ross drove in a run with a ground rule double. One out later, Ellsbury lifted a single into center to drive in the second run of the inning. The Red Sox struck first with back-to-back doubles in the top of the first inning by Dustin Pedroia and David Ortiz to give Boston a 1-0 lead off Cardinals starter Adam Wainwright. St. Louis answered back in the bottom of the fourth on a solo home run by Matt Holliday. Wainwright went seven innings for the Cardinals and allowed three runs on eight hits and one walk (to Stephen Drew no less) and ten strikeouts. Ortiz had three more hits for the Red Sox while Ross and Bogaerts each added two.